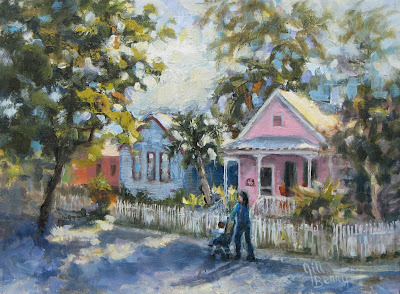 Plein Air Painting Journal: "Morning Stroll"
Morning Stroll (SOLD). 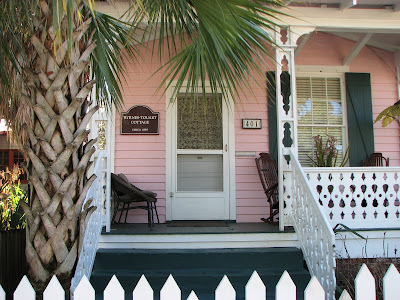 It was the unique colors that attracted me to this little trio in Pensacola's historic district. As usual when it's time for a break, we make the rounds and check on others in the group. Rhoda was set up across the street, she had spotted a line of clothes drying between two houses. A great subject and well composed. On my stroll I realized the house I was painting was built in 1885! 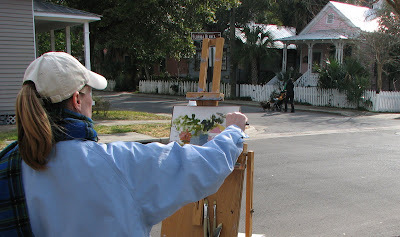 On this brisk morning, a passing bicyclist greeted us with- "y'all should come paint my hood". His words left me thinking...thinking about, the pride of our home-place... the value of community... and the honor involved in it's documentation. As I painted, this became less about the colorful exteriors, and more about the many decisions made through the years since 1885, to restore rather than tear down. As artists we can preserve history. These are charming cottages and you did a charming painting of them. I think I need to visit your part of the country, it has a very different feel than I would have guessed. You are right, artists are historians of sorts. A lovely and colourful painting as usual Jill. Well done, and all the best. I just awarded you the Sunshine Bloggers Award! Please come to my site to receive it. Looks like it's been kinda chilly in Florida. Thanks for showing us this charming neighborhood, Jill. It reminds me of Melbourne where I've walked the streets with my mother-in-law who lives there. Charming as well. Such a beautiful, inviting painting. 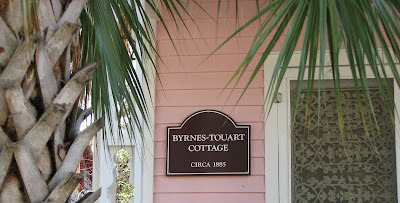 Enjoyed reading about the preservation of this historic cottage- so glad it was preserved - the older buildings seem to have a character about them that modern buildings sometimes lack. Glad you included the reference picture... it's fascinating to see what elements you decide to include and what you leave out. Wow! 1885...so old but so well preserved.And you've painted it so well!Yours is a great place Jill! I love the subject, the mom strolling with her baby, the charm of the old neighborhood. You did a wonderful job with your colors and brush work. Well done Jill. What beautiful and fresh dappled light. Looks and feels like a great day for a stroll. Cool little cottages Jill. Keep up the good work! It is so great when preservation becomes a reality over tearing down. Wyoming is so new that a lot of historical buildings still do remain though old ranches, trappers cabins and old dugouts that once housed families are going fast. It seems strange to think that my mother who is only 20 years older than myself lived in a Sod house with log and dirt roof. As she said it was warm in winter and cool in summer but when it rained too much it was a mess. Her place was one of the first in that part of Wyoming that had a wooden floor. Her mother, my grandmother used to say you can talk about the good old days but she would not want to live through them again. I liked seeing the photos of the painting which included the subject matter. I enjoyed looking at your work - very talented. Thanks to everyone for chiming in on this work & what it brought to mind for you. It's great to be able to share little slices of our worlds via this modern technology and at the same time admire the places of the past. Until then, thanks for sharing your skills... you're the master of ~light & shadow~. and for highlighting my work as note-worthy. Thanks to you for the Sunshine Award too. Yes it is great to be ~linked~. I appreciate you. 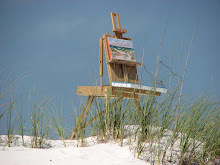 To know that my art-work and posts are speaking a "message" to the viewer, the reader, the fellow artist. That is a terrific thought. Super day to you all! Such a beautiful and charming historical szene! I love your style and it reminds me of the great French impressionists. Greetings from Luzia. Does the mother know she's been immortalized? It's funny, a lot of the people I photograph are never aware they've been published. I sometimes wonder if they mind. You have a gift of encouragement! This subject was brought up by a client picking up a painting recently. She said, if her house was in a painting, she would want to know it. She even suggested a local historian who would be interested in my work.